Randhar was angry. 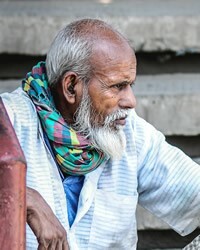 He had worked hard to raise enough money to buy a small piece of land, and then he was denied. He complained to a government clerk, "I was refused the right to buy the land. They sold it to Bandhu because he is a Shaha Banik and I'm a Dalit Sunri. I'm tired of this! They receive all the privileges just because they claimed years ago to be linked to the forward castes. They are no better than the rest of us Sunris." Though the Sunris have several subgroups, one of their branches is called Shaha Banik. In 1931 the British-India government officially declared they were higher in the caste system then other Sunris. Even today this still allows them to receive more social benefits which causes resentment among other Sunri subgroups. The total Sunri population is over 800,000, and they reside primarily in the states of West Bengal and Bihar. Most earn their living through farming, trade, fishing, and being household service workers. They have made good progress in the field of education. 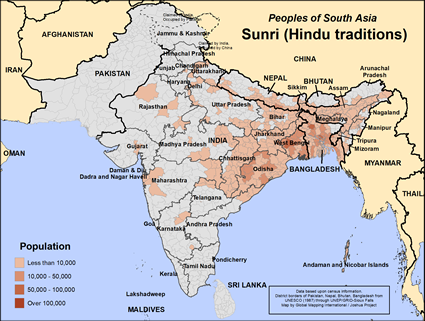 All Sunri subgroups are tightly connected to their Hindu beliefs, and there are apparently only a few believers among them. * Pray that Christian Dalits and other believers will lead each Sunri subgroup into knowing God as their Lord and Savior. * Pray that many will come to know that in God's eyes they are equal among all men, and He loves them all the same.View Sunri (Hindu traditions) in all countries.